The Rev Thomas Guthrie DD (1803-1873) left the Church of Scotland after the Great Disruption of 1843, and joined the Free Church of Scotland. This event created a massive split in the Church of Scotland, and resulted in the creation of the aforementioned Free Church of Scotland being established. He goes on to state that whilst preparing to preach in a previous ministry of Strathbogie one Sabbath, he was handed a Court of Session interdict by a servant of the law, forbidding him to preach in either the body of a kirk or a graveyard. His response was that he acknowledged the law servants duty, and advised that he would do his. The penalty for breach of this interdict was “to get lodgings free gratis in the Calton jail”! The Rev Guthrie put the interdict under his foot, and preached the gospel. He defied the law to punish him and did not. 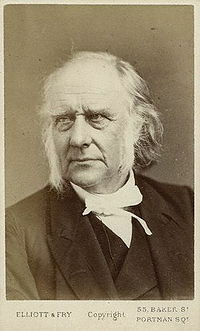 He was one of the most prominent leaders of the Free Church movement. When he preached at Tanfield Hall the cheery tone of his voice was enthusiastically welcomed by the multitude who had attended worship there. On 18th May 1843 he advised his parishioners, “I am no longer minister at St Johns (Cowgate). I understand that this day there has been a great slaughter in the Old Assembly” (Church of Scotland General Assembly). I know they have resolved to declare my church vacant. They may save themselves the trouble.” Stern words indeed. The Rev Guthrie went on to prove more popular than ever. Reference Material: The Life of Dr Guthrie, mostly from his own lips, Published by John S Marr & Sons of Glasgow 1873, pp.30-36, 40-44 & 51.54. Thomas Guthrie in 1843 image taken from here. The image of his resting place at The Grange is taken from here.